Nothing beats a big ol' slice of meatloaf on a cold winter day, except maybe a big ol' slice of meatloaf stuffed with cheese and wrapped in bacon! So Thanksgiving has come and gone, and visions of sugar cookies are dancing in my head. Shopping, and wrapping, and baking are all being crammed into my schedule, along with the other things I need to do for the blog. I honestly think that once December hits, I don't sleep again until after the New Year. I always say this is my favorite time of the year, but it is the most tiring time of the year too. Part of it might be that, as a food blogger, I tend to have a pretty boring schedule. Same old, same old, every.single.day. I am a homebody for the most part. I love the research, testing, writing part of being a blogger. The only times I seem to venture out is when I go shopping for food or blogging supplies (Goodwill is one of my best friends), or when I go see my kiddos. Now before you go getting images of me being a hermit hiding in my kitchen, let me explain that I live in a verrrrrrrrrrrrry small town. There really is not much to do plus I live in the Pacific Northwest, which means we get rain a good 8 months (or more) out of the year. It is very easy to get comfy in my yoga pants and sweatshirt, light a fire, and pile onto the sofa with my laptop and type away. I have my deer that come by a few times a day to peer into my window and give me the "I am so hungry you need to feed me now" pitiful face. Oh and trust me, they have that one down perfect! I have my little fat grey squirrel that waits in the bushes for the deer to leave hoping they left him something to nibble on, and my kids. There really is nothing I love more than having all of my kids come over. We all get into the kitchen to cook together, laugh, and eat tons of good food. A while back my kids got me hooked on a YouTube show called Epic Meal Time? Seriously funny (although their humor and language might not be everyone's cup of tea) and they even have their own show, called Epic Meal Empire, on Spike TV now. One of their trademarks is wrapping everything in bacon. They even made a cup out of bacon! Now that I have it down, I want to wrap everything in bacon! I can see how they got obsessed with it. We actually made this meatloaf for the first time and cooked it in the smoker, but that was a test run so I didn't take photos. I promise I will have it on the blog by grilling season! So we sat down, on a cold rainy night, to a big plate of meatloaf, mashed potatoes, and corn. Such a wonderful family meal with my awesome family!! I am a happy happy girl! Line a rimmed baking sheet with parchment paper or tin foil. Lay out your bacon and weave it into a square. In a large bowl whisk together the eggs and milk. Then add the bread crumbs, onion, salt, basil, oregano, and pepper. Stir to combine then add the ground beef. Using your hands, combine the meat with the egg mixture. Lay the meatloaf mix onto the bacon and press it into an even layer. Spread the BBQ sauce down the middle and sprinkle the cheese. 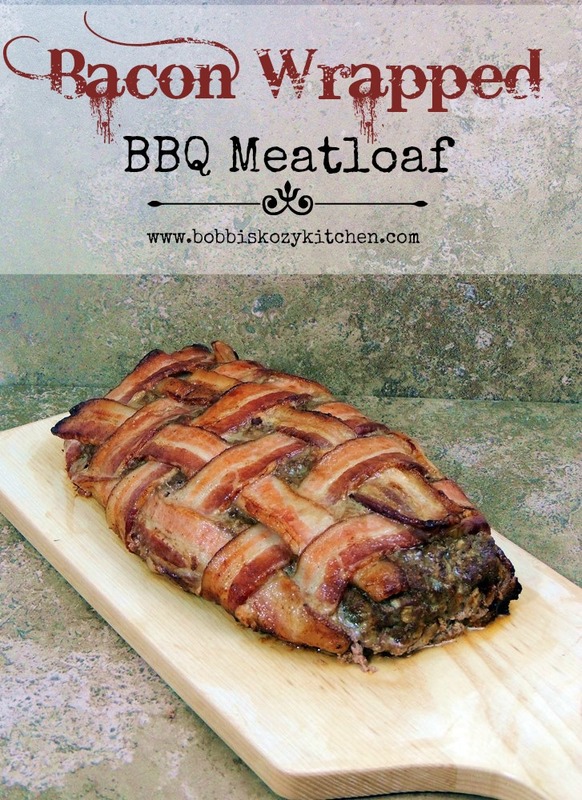 Carefully wrap the bacon around the meatloaf and shape into a log. Serve with extra BBQ sauce if desired. Bobbi, I hadn't made meatloaf in probably two years until a couple weeks ago. It just sort of fell by the wayside, I don't know why. Then I made it, and my husband said "Let's have this once in a while!" I always just lay the bacon over the top, but maybe next time I'll shake things up with the lattice; it IS cute! This one with the cheese and barbecue sauce would be a way to change it up once in a while.